These Vegan Carrot Chocolate Cupcakes are super moist, full of flavour and slathered with a delicious chocolate ganache on top. Fasting for Easter was not something we were looking forward to when we were young maybe because the older generation used to cook the same Lenten dishes, over and over again, mostly dried legumes and seasonal vegetables. Now you can find all sorts of fresh or frozen vegetables year round and you have cookbooks, food magazines, T.V. shows and of course the internet to refer to if you are looking for something to cook. Cakes were out of the question during lent because people did not have the knowledge how to make them. They just followed some vegan recipes they knew and could not understand why they were using eggs and milk or butter and with what they could substitute these ingredients. I wanted to make a milkless and eggless chocolate cake and I had some fruit which needed to be used so I originally thought of using the pears, a banana and an orange but the pears were too ripe so I couldn’t use them. However, reading so many recipes every day I learn a little bit here and a little bit there, so making a banana bread with just one banana and no butter, no milk and no eggs seemed out of the question, so I decided to combine a Lenten carrot cake and a chocolate cake I make and make a new recipe. I wanted the cake to be dark so I preferred to use dark brown sugar and cocoa and since the orange juice was not enough, I decided to substitute the remaining orange juice with pomegranate molasses/syrup which would give the extra acidity needed for the baking soda and baking powder to react. I have fallen in love with this syrup although I have only recently started using it. Actually since then, I am making my own Pomegranate syrup and molasses and I have been using it in salads and for marinades, in cakes etc. I am not afraid to experiment and since I wanted to try it, I decided to use it. I am glad that I did, as the cupcakes had a lovely sweet and sour taste which gave them a distinct flavour and made them very addictive. I am sending this recipe to Pourmina of Tasty Treats for her event For the Love of Chocolate. On another note, tomorrow is a Public Holiday in Greece and my daughter’s name day (onomastiki eorti). It’s a tradition to eat Bakaliaros and Skordalia on that day as it is one of the two days during Lent, when fish is allowed to be eaten. Tomorrow is both a religious holiday, the Annunciation of Virgin Mary, which is called Evangelismos in Greek and it’s the name day for Evangelos and Evangelia (Elia), and a National Holiday, as on this day we also celebrate the Greek Independence Day. Preheat oven to 180o C.
Combine the flour, cocoa powder, baking powder, baking soda, salt and orange zest. Add the flour mixture to the fluids and mix with a spoon. Line you muffin tins with cupcake cases and spoon the mixture with equal amounts into each cupcake case. Bake for 15 – 20 minutes or until a knife inserted into the centre comes out clean. Leave in the tray to cool for 5 minutes before turning out to cool completely on a wire rack before glazing. In a bain Mari, melt the chocolate; add the margarine and pomegranate molasses and mix. 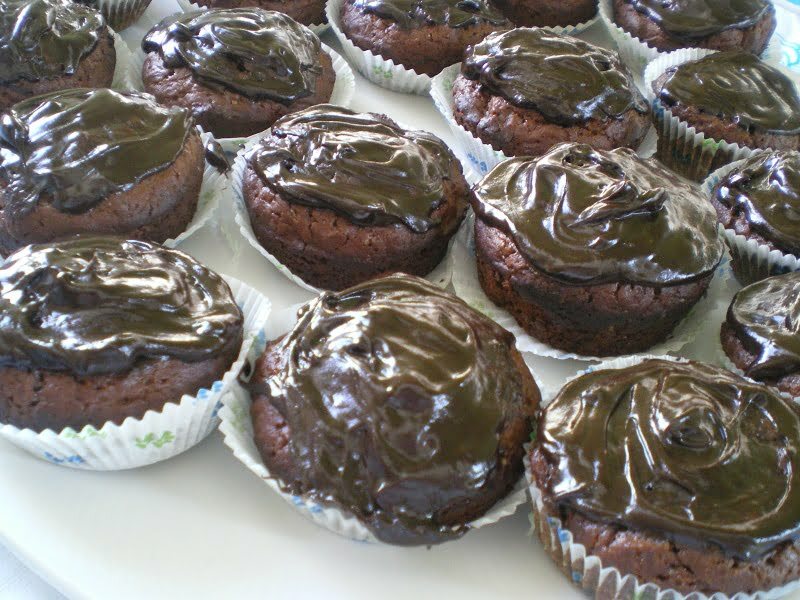 Glaze the cupcakes while chocolate is still warm. What lovely flavors! These cupcakes look delicious! Thanks for the lovely entry Ivy…they look so moist and addition of pomogranate sounds cool. Lovely cupcakes you have there. I wonder if I can find molasses in Basel. Have a wonderful holiday tomorrow Ivy. Enjoy the Bakaliaros and Skordalia. Food has come such a long way to make way for those who have allergies. So many recipes available for eggless, wheat-free, gluten-free, etc. Wow – kudos to you for putting this recipe together. I am always so afraid of experimenting with baking. I should really pick up some of the pomegranate syrup. I’m so glad your creative Ivy cause I’m not! I’ve never heard of the pom molasses before. The cupcakes look lovely! I am SO impressed at your creativity – and the cupcakes look delicious. I can just imagine the great flavour imparted by the pomegranate. Ivy, they look so moist and delicious! Thanks for the recipe as I have been after a decent one for ages! I have never made a vegan cake and this cup cake looks so yumm delicous. So diring the fasting you may not use eggs too? Happy Cook, fasting means no meat and no animal products i.e. dairy or eggs. Delicious!!! 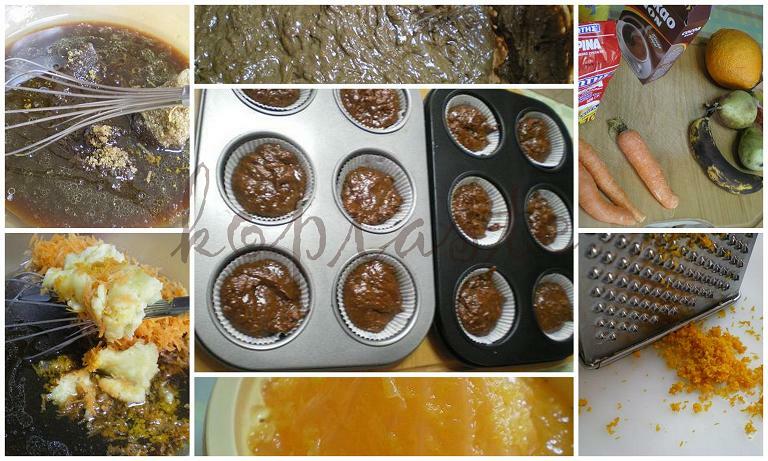 These sound fantastic, I love the fact that there is orange, carrot and banana in these cupcakes. I bet they are extremely moist. I actually have never made cupcakes before. Great photos as well. Chronia Polla, Ivy. These look good. I have been hesitant to try vegan anything but with the pomegranit, it’s got to be good. Mmm. What an interesting combination of flavors! And the result looks delicious. Yum Ivy! And vegan as well – I want a dozen! The cupcakes are so good ! And happy name day to your daughter ! In italian is called onomastico from greek, how do you call it ??! Thank you Natalia. We call it onomastiki eorti. Second bottle of pom molasses…you do enjoy it! I love it in dressings too and you cupcakes make “nisteia” easier, for sure. Xponia Polla to Evangelia and your bakaliaro must have been delish!